It’s rare to find a film as famous, yet universally hated, as 1999’s The Phantom Menace. Even now, the mere mention of the film is enough to attract derision from critics and something akin to pure hate from fans of the original Star Wars trilogy. Why has it attracted so much criticism, and is this justified? Can anything good be said about Star Wars: Episode One? Well, since I always like to at least start my posts by saying something positive, let’s look at ‘The Light Side’. First off there was the trailer, which seemed to promise everything that we ever craved from a new Star Wars film (it’s a shame they had to blow it by adding 132 minutes of padding!). Then there are the backdrops – the grandeur of Theed and the Art Deco wonder of Coruscant. There is the CGI in the first journey to the underwater city – a fine fantasy moment that is truly breathtaking. On a girly note, there is Queen Amidala’s geisha get-up and a range of nice frocks. Lastly, two words: Darth Maul. Unfortunately, we now have to look at ‘The Dark Side’. Things do not start well. In place of the Imperial Star Destroyer-sized sense of wonder of A New Hope’s opening, you get an apologetic pan of a spaceship with all the cosmic majesty of the 8:15 train to Tunbridge Wells. Then there is the lack of pace and tension. Where Star Wars hurled us into a life or death situation from the get-go, The Phantom Menace basically starts with two all-powerful Jedi passing the time, being offered refreshments by the cringing Neimoidians. Lucas does not seem to realise that having such an imbalance between the heroes and villains creates a lack of tension and it does not help that, with their dreadful cod-Chinese accents, the Neimoidians are a fairly offensive racial stereotype to boot. Then there is the fact that Lucas, for some inexplicable reason, decided to film a space opera about the ‘taxation of outlying trade routes’. A script that contains the words committees, commissions, procedures, debates, delegations, negotiations, ratifications and nominations is overwhelming in its mundanity. With A New Hope we had the wonder of fairy tale; with The Phantom Menace we have the churning of bureaucracy. While the actor can hardly be blamed, Liam Neeson’s Qui Gon Jinn is just plain dull. We needed a wizard – Anthony Hopkins in The Mask of Zorro – but instead we were given a walking, talking fortune cookie. Call the script doctor George! There are several things in The Phantom Menace which just make no sense at all and/or are totally unnecessary. I mean, why have that ‘midichlorian’ nonsense? It’s like someone performing an autopsy on Santa Claus. The Force is interesting when it is an unknowable, undefinable thing – it quickly loses this aura when you start to dissect it with silly cod-scientific explanations. Ditto Shmi Skywalker’s ‘virgin birth’. But the gaping hole in The Phantom Menace is its ostensible star, Mannequin Skywalker himself, Jake Lloyd. Again, the actor cannot possibly bear the full brunt of the criticism for the daft script that he is given but, on any analysis, Lloyd is not up to the challenge of carrying a major Hollywood film. Just look at Haley Joel Osment’s performance in The Sixth Sense, released the same year with a young star of about the same age, to see how far Lloyd falls short. Anakin should have been an angry brat, briefly succumbing to the Dark Side of the Force, not a jolly, heroic young moppet. Although all of these criticisms and more have been put to Lucas on several occasions, his stock response time and time again is that The Phantom Menace was ‘only a kids’ film’. Yes, but so was Jason and the Argonauts, The Nightmare Before Christmas, Antz, Chitty Chitty Bang Bang and The Railway Children, all of which managed to have comedy, tragedy, compelling stories, witty scripts and fine acting. Just like a sweet old film called Star Wars: A New Hope. Queens aren’t usually elected, but there’s no reason they couldn’t be. The Holy Roman Emperors were elected, after all. Very true, but if you’re going to have an elected monarchy, at least have one that makes sense. No 14 year old was ever ‘elected’ to rule the Holy Roman Empire! I’ve seen worse. Losing Jar Jar Binks would’ve helped. But “The Empire Strikes Back” will always be my favorite. “Can anything good be said about Star Wars: Episode One?” It proves, without a doubt, that George Lucas has been insane for years and no one will tell him or commit him. I didn’t mind Menace when it first came out, mainly because I was just hungry for something new on the Star Wars front. That said, I still like the original trilogy better (and of course Empire is my favorite- anything else is sacrilege) and when I have my series screening for Star Wars Day next year, I’m doing them in Machete Order. I didn’t really have any problems with this movie, but it is an interesting perspective and she brings up some good points. I actually enjoyed seeing Anakin as a enthusiastic, heroic child. It shows just how easily circumstances can inspire drastic changes in us. I wrote a piece about this and how Anakin is a wonderful example of a modern tragic hero. Link to come shortly.. What do you all think of The Phantom Menace? Great movie or Mistake? There is no way that the film could have lived up to the hype and expectations. However, for me, this movie was like Star Wars: Intergalactic C-SPAN. Part of the issue is that George Lucas is not actually a great writer–idea guy, you bet. But his dialogue is terrible and he seems to have this fear of grittiness in his characters and settings (which is hard to do considering how much time they spend on a planet covered in sand). I would even go so far as to propose that the advances in technology worked against him. Watching the original films, there is this unpolished feel to them. Mos Eisley looks like a real bar. Everything in Menace is so glossy that it becomes flat, including the performances. Oh, my favorite topic. Haha. My kids LOVE this movie. But they didn’t see A New Hope first. They love Jar Jar and the speed races. So in all aspects Lucas accomplished what he wanted. The kids love it. But I totally agree with you on all your points. I would also like to throw in that in general they didn’t do a great job filling the iconic Anakin role. It was a huge thing to live up to, and neither actor filled Darth’s shoes. But I still love the movies because they are part of the whole. Lucky for George, New Hope came first. To be honest, I really enjoyed the movie when I first saw it *hides from the rotten tomatoes* I think it was the fact that it was a new chapter in the Star Wars story and I loved it from a lore perspective! It was only later after watching it several more times that I realised just how terrible the dialogue, the acting, the storyline was.. pretty much everything except the scenery, really. I think that The Phantom Menace was definitely the best of the prequels, mostly because Anakin isn’t so whiny and emo yet. The biggest problem with the prequels is that the old movies were too much to live up to. Any modern adaptation won’t have the same charm. Oh, sigh…it is what it is, and today it is a piece of popular media history. I don’t fault George; it was his vision, and he’s entitled to it. What I do fault, largely, is the script. The best actors in the world (Liam Neeson, Ewan McGregor, for example) can’t work miracles with shoddy dialogue. It almost feels as though George was trying too hard to capture and bottle the magic of the original trilogy…and in doing so, created tinned spam. If you look past the dialogue and the script and the overabundance of political details, the story at heart is excellent – lost innocence and shattered love – and completes the story in the sense that it is now Anakin’s redemption, from start to finish. Good story – poor storytelling. What an indepth review, i did enjoy reading! 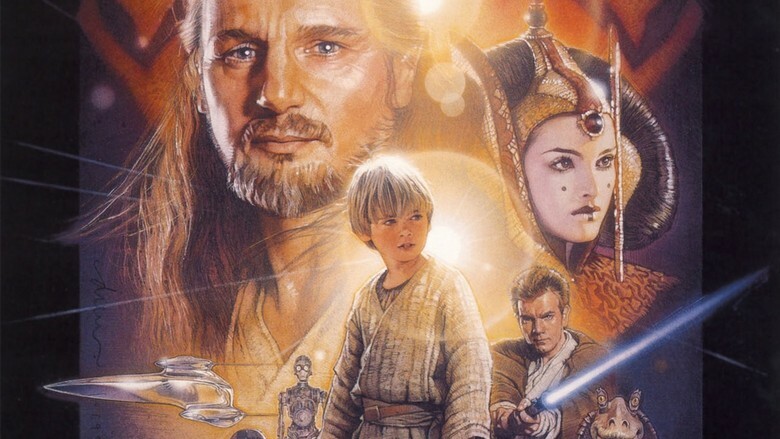 I am an enormous Star Wars fan (I have over seventy of the novels) and I always feel like enormous failure as a Star Wars fan because I always enjoy the Phantom Menace. It’s cute. I am a poor excuse for a geek. Well said, Ash! You were right on point with everything! This post makes me want to get back into blogging. I’ve long had an idea of how I would have written the Star Wars Prequels, working with Lucas’ content, but cutting out what was good, fixing pacing and leaving far more room to build the chemistry of Anakin and Obi-Wan, so Anakin’s turn to the dark side would have actually felt more tragic. You’ve inspired me to get that post done one of these days! Reblogged this on The Mishaps & Escapes of the Afro Jedi.